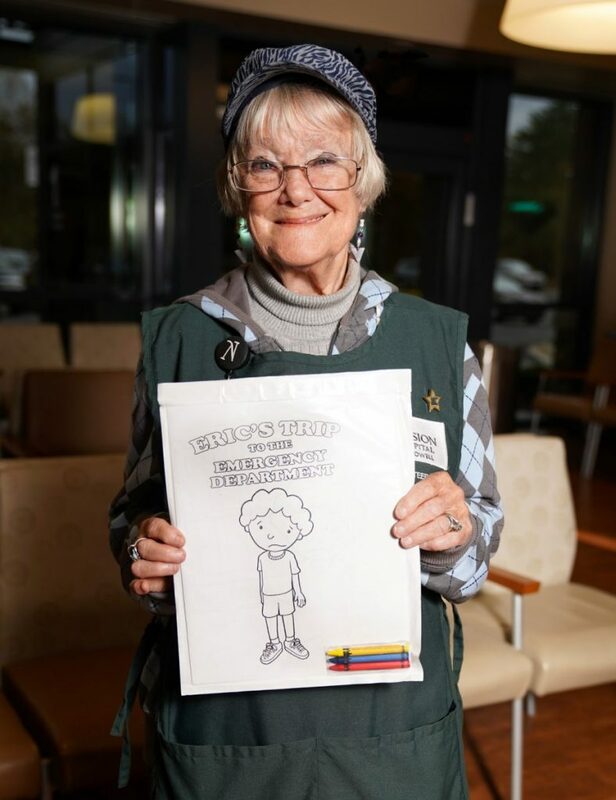 Editor’s Note: Mission Hospital McDowell volunteer and children’s book author Nancy Northrop Sluzinski is the author of Eric’s Trip to the Emergency Department coloring book and ABC’s for the Child Within, both donations to the hospital. The inspiration for creating the coloring book for children entitled Eric’s Trip to the Emergency Department came from Bill Briggs (an interim emergency department director) who noticed that I had written children’s books sold at the McDowell Hospital (old hospital) gift shop. He asked if I could create a coloring book as he saw the need for something like that for the children coming to the ED. I said YES, but that I would have to contact Jeff Duckworth who illustrated one of my books because I was only a “story” person. Jeff immediately said YES and produced the nine wonderful illustrations in a matter of weeks. I also decided to have the words translated into Spanish, so the parents could read what the children’s coloring pages were all about. Cindy Meraz, a McDowell Hospital employee, provided the words. Philip Long, the Director of Volunteer Services, gave his approval, as well as providing the crayons and plastic sheaths for the booklet…and the rest is history! Why do I volunteer? When I was a little girl (I’m 79 now! ), I can remember my Grandmother talking about volunteering for the American Red Cross at home in New York (1916-WWI) and Mother talking about the same thing — only in Connecticut (1945-WWII). When I was “30 something,” I volunteered (for ARC) at the VA Hospital in Brockton, Mass., so there must be a “VOLUNTEER” gene in my ancestry somewhere! 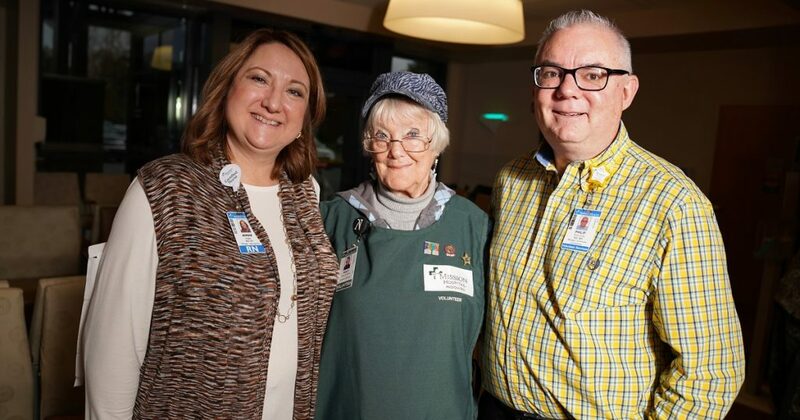 And the reason I say this is because when my husband and I moved to Marion in 1996 (we were retiring vegetable farmers), I stopped by the McDowell Hospital and met the Volunteer Director — Sally Reep. She saw my potential (I had been a Nurses Aide) and placed me in the Emergency Department with Ruth Coward. I worked on the floor, putting up supplies, changing beds, etc. I volunteered there until 1999, when I had to get a “REAL JOB” to help with the farm expenses. It wasn’t until after my husband passed away in 2009 that I thought of volunteering again. I joined the local chapter of the American Red Cross (naturally), but once again visited the McDowell Hospital, and in 2013, met the current Director of Volunteers, Philip Long. He said there was a new job in the ED calling patients who had been in the department the day before to see how they were the next day. That was something I knew I could really do as I had also worked in sales over the years and was comfortable on the telephone. Now I call Monday-Friday mornings and average 1,500 calls per month. When we moved to the new Mission Hospital McDowell, a desk was set up for me in the ED Manager’s area so that any critical concern of a yesterday’s patient was handed over to the manager, Angie Pettus. In conclusion…as I drive home from the hospital each day, I know I have made a difference by letting an ED patient know they are still cared about the next day. To explore volunteer opportunities at Mission Health, visit missionhealth.org/volunteer .